If you think that there would not be any new designs that will surprise you the way i-whatever did, think again. Especially when you were rushing the red light. 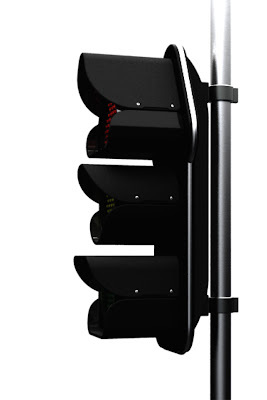 Surfing across the web in a lazy evening brought to my attention the design of Uni-signal, a traffic light with a slight variation from the norm. 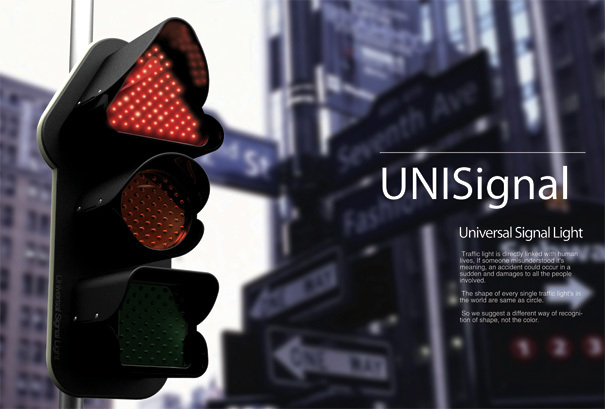 Uni-signal light - a new idea for the color blind (image taken from Yanko Design website). Uni-signal is supposedly Universal Signal Light in short, and is the brainchild of 3 South Korean designers: Ji-youn Kim, Soon-young Yang and Hwan-ju Jeon. The purpose of this new design from Yanko Design is to aid the color blind to traverse the traffic or to get behind the wheels of an auto in the first place. Instead of just the usual 3 colors of the traffic light, each color is located within different shaped cover, so drivers could rely on the lit up shape as well as the color to understand the relayed instruction in a road junction. Front and side view of Uni-signal (images taken from Yanko Design website). You could well be wondering how much this could help, just as most forum goers did in Drive. First of all, it needs to be understood that why reading a traffic signal proves to be difficult to the color blind. Red is on top, green is at the bottom, so bottom light lit means go, top light lit means stop, right? Not exactly. How do you recognize which is which in a horizontal layout? As a matter of fact, if you are driving in Tipperary Hill, a district of Syracuse, New York, you would be surprised to know that green is on top of red (see the below video and this Wikipedia article). A surprising layout of traffic signal in Tipperary Hill. Not all color blind are equally blind - there are numerous types of color blind, and each has their own color recognition problem. According to Drive forum, one of them claimed that as a color blind, he would not recognize at a glance a green light and the surrounding white and yellow lights at night, unless he paid attention to them, which could be difficult during driving. 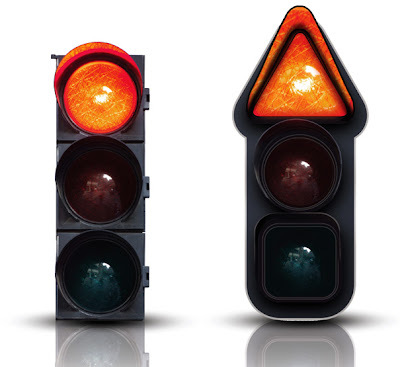 Of course, there are much comment on the proposed shapes, most mentioning that the shape of a triangle for red light imply the message 'go forward' and may confuse drivers. I believe that this is beyond the point of the design, as the shapes can be changed by individual countries, just as the symbols within the traffic lights and their blinking patterns differ between countries. It is the message imparted from this concept which has drawn my attention - that thoughts are given to the physically challenged to use everyday items that we have taken for granted as user-friendly. This goes to show that improvements are still possible on most items. 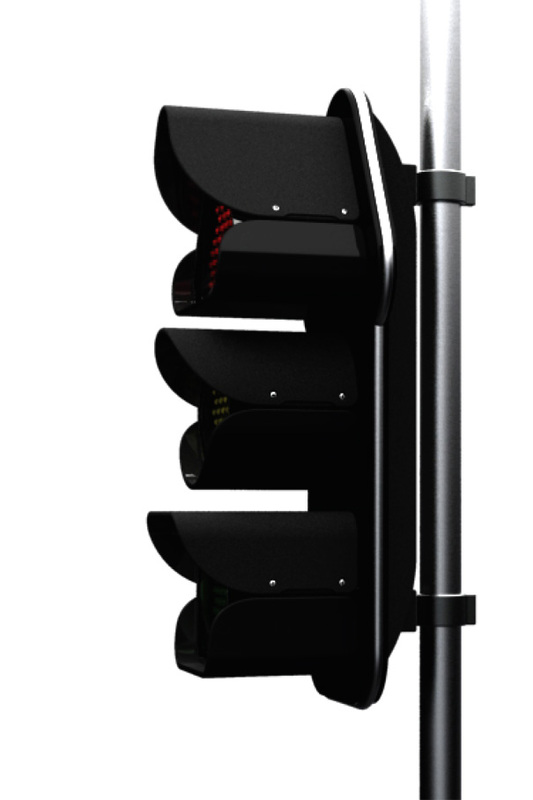 In fact, in recognition of this necessity, Quebec, Canada has deployed some of its traffic lights to be in this concept, although they are not following the same shape as proposed in Yanko Design's concept. This reinforces my point that the symbols are dependent on the countries' regulations, and it is the concept that matters. 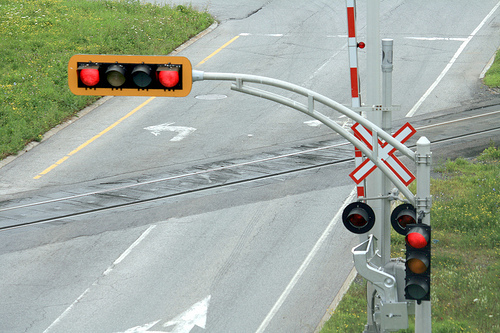 Specially shaped traffic light in Quebec, Canada for the color blind (image taken from Autoevolution). There are a lot of comments on this design but from my perspective as an engineer, there is a point that I have to admit makes sense. With different designed shape for each light, this means that maintenance cost and part cost would be higher. The reason behind this is because there needs to be 3 different types of covers prepared at all times, as you would not know which one will break down. Manufacturing costs will also increase a little due to the additional 2 shapes' mold. Still, this should not be a major roadblock to improving traffic lights for the color blind. I personally feel that Uni-signal may not be able to help the color blind drivers much, but again I emphasize that I believe that it is the thoughts and intentions of the designers that is important. As an engineer who worked in companies which prioritized monetary values over society commitment, I am beginning to feel disillusioned. Running across concepts like this one encouraged me to once again embrace my wish to bring value to the society through my engineering passion. Kudos to the designers of Uni-signal! Actually, with the Quebec shape coded symbol traffic signal, you only need two different lens housing. The square red obviously needs its own separate one. You would need something like pedestrian signal housing for that. But for the yellow diamond and green "ball", the standard for the green will work for the yellow. The round lenses could simply be coloured yellow or amber and then have the diamond silk screened or stenciled onto the ball lens. This would reduce costs a great deal. I love these signals and have these lenses in my collection. I also have video of these which I have filmed in Quebec. I’m surprised that associations for the blind haven’t pushed these signal lenses in the US for colour blind drivers under the ADA. I really thought they would take hold in Canada. I know British Columbia was thinking of using them for a while. PEI does use them. They were used in New Brunswick and Nova Scotia, but never made it to wide spread use. They have since been replaced with standard signals in those provinces. Also, Quebec stopped using them on provincially maintained highways, but is still legal, there. And still maintained in some municipalities. I have these provincial standards. By the way, these signals are placed in the horizontal position, which you show, and, vertical. Actually , this would help color blind drivers a lot if done right. Red should be octagon, Amber triangle with point at bottom, and green could remain round or be square. Besides sometimes being horizontal, green lights blend in with regular street lights to many color blind people so we don't have time to look for position. Also, when there is just one light in the middle of intersection, flashing red one way and flashing amber the other, I have NO IDEA which is which. I have to guess. I ave gone through red lights and stopped at Amber. If they were octagon and triangle it would be easy.